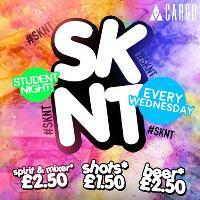 Wednesdays Let loose and carouse - Cargo brings you your new favourite Wednesday night out! Presenting SKNT - the coolest student party catering to all of your mid-week hedonistic needs. We’ve got our best resident DJ’s spinning party jams all night long from up to the minute bangers to former forgotten favourites. Show your NUS card with ID and get £1.50 shots and £2.50 drinks until 11PM. Surely you know what to do next! Please be advised to arrive 30 minutes before last entry time to avoid additional door fees. Cargo tickets are valid until 10pm only!